BoI secretary-general Duangjai Asawachintachit at the signing ceremony with Mie governor Eikei Suzuki. 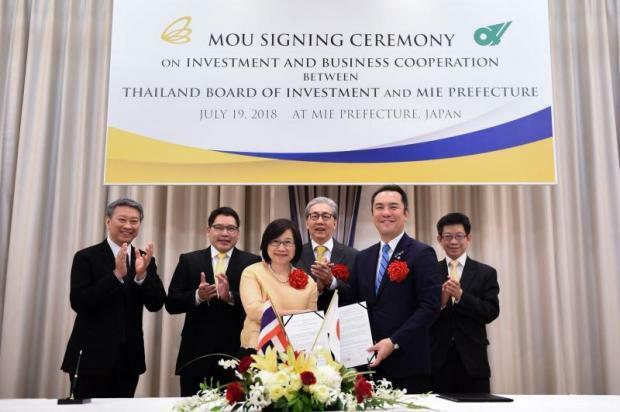 Thailand and Mie prefecture, in the Kansai region of Japan's main Honshu island, have agreed to jointly establish the Mie-Thai agro-industrial cooperation centre at the Eastern Economic Corridor of Innovation (EECi) in Rayong. The centre will focus on two industries, future food and food processing, said Deputy Prime Minister Somkid Jatusripitak, who met Mie governor Eikei Suzuki during Mr Somkid's Japan trip last week. Mr Somkid said that apart from the agro-industrial centre, Mie prefecture and Thailand's Industry Ministry pla n to work to persuade the private sector and educational institutes from both countries to form partnerships. "Mie is home to a number of manufacturing industries which had economic growth as high as 7.8% last year -- the highest in Japan," he said. "More importantly, Mie prefecture's economy is diversified, from industry to agriculture and tourism. Mie is especially famous for adding value and innovation." Thai officials are hopeful that Mie will become instrumental in driving startup development and cooperation between Thailand and Japan. Small and medium-sized enterprises (SMEs) from Mie prefecture are also keen on investing in Thailand's much-touted Eastern Economic Corridor (EEC), especially in food technology, chemicals, electronics, aviation, biotechnology, medical equipment, education and tourism. Last November, Mr Suzuki led 30 executives from 23 SMEs to Thailand to learn about the EEC, particularly in terms of investment in food technology, as Thai food producers still lack proper processing technology for exports. The SME executives also expressed interest in investing in electrical appliances and the automotive industry. Mr Somkid earlier said a new wave of investment by Japanese SMEs in Thailand was anticipated. He noted that the number of SMEs in Mei alone exceeds 10,000, with many of them strong enough to invest abroad. There are 30 companies from Mie prefecture with a total of 11.2 billion baht already invested in Thailand. Significant projects include SEWS-Components Thailand, which invests in manufacturing wiring harness components, and Yasunaga Thailand, which makes engine and automotive parts. Japanese firms are further committed to supporting Thailand on education, with 30 Japanese universities planning to develop human resources to support EEC development. Japan is the top foreign investor in Thailand, according to the Board of I nvestment (BoI). Japan submitted the most applications to the BoI in 2017, accounting for 133 billion baht, or 47% of total foreign investment. Get full Bangkok Post printed newspaper experience on your digital devices with Bangkok Post e-newspaper. Try it out, it's totally free for 7 days.